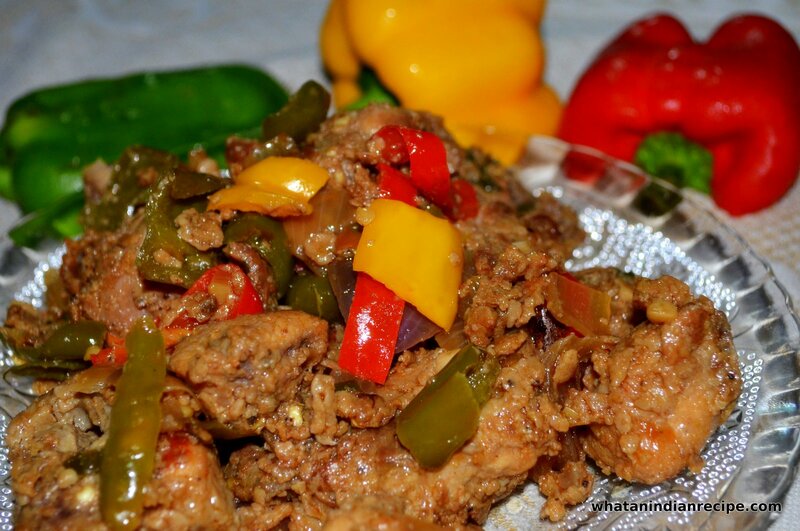 Dry Chilli Chicken is a popular Indo-Chinese dish of chicken. It is also considered as a loose term used to describe a variety of dry chicken preparations in India.Though mainly boneless chicken is used in this dish, some people also recommend to use boned chicken too. Now heat oil in a pan/ kadhai/wok and fry the chicken pieces and keep aside. Do not throw away the excess marinated mix. Heat 2 tsp oil in the pan/kadhai/wok and add chopped garlic, green chillies and onions and sautÃ© for 2 minutes then add the bell peppers and again sautÃ© for 2 minutes. To this add the remaining soya sauce, chilli sauce , tomato sauce, 1 tsp vinegar, salt and pepper. Add the fried chicken pieces to this and mix well. Now mix cornflour and maida in little water and then pour this onto the chicken. Mix well . Check seasoning and once the chicken is well coated with the all the sauces remove from fire and serve hot with fried rice/ noodles, it also is a good appetizer.